Slavery, food, treasure: Who really owns the oceans? As India, China and Brazil seek new sources of cobalt, copper and nickel to build the gadgets demanded by their booming populations, they are preparing to mine a new realm – the dark depths of the ocean. Over the next decade India will spend more than $1 billion to develop and test deep-sea technologies – including human-piloted exploration submarines – in the Indian Ocean that could give access to once inaccessible mineral riches up to 11km under water. “We have to depend on ocean resources sooner or later ... there is no other way,” said Gidugu Ananda Ramadass, head of India’s deep-sea mining project at the National Institute of Ocean Technology in the southern city of Chennai. But mining the seas – home to the vast majority of life on Earth – carries huge risks and could cause irreversible damage to the environment, campaigners warn. Oceans – which scientists say are less understood than the moon or Mars – cover more than 70% of the Earth’s surface, yet less than 20% of their seafloor has been mapped or observed, according to the US National Oceanic and Atmospheric Administration. And what lies below the waves is worth trillions of dollars. The so-called “blue economy” of marine resources is expected to contribute $3 trillion to the world’s GDP by 2030 – equivalent to the size of the UK economy – up from $1.5 trillion in 2010, according to the Organisation for Economic Co-operation and Development. But from overfishing, to a rush to mine deep seas, to slavery on fishing boats, the world’s oceans are a source of growing dispute, not least over who should get access to them. 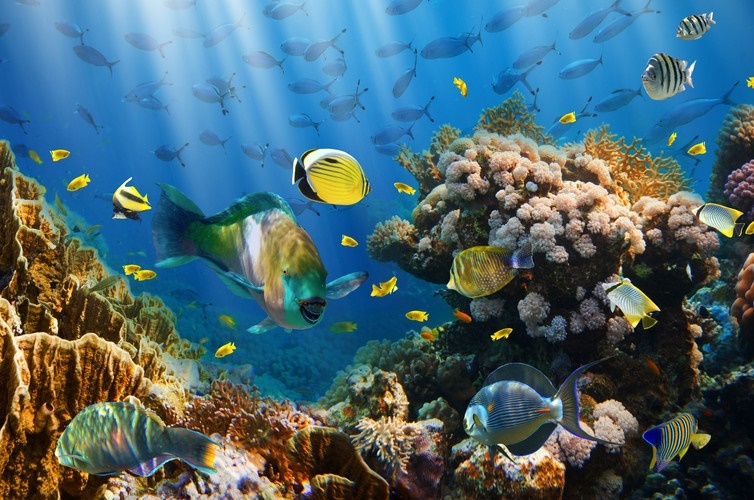 Experts say oceans are a neglected area of global governance despite the United Nations’ 1982 Convention on the Law of the Sea and the 193 member states agreeing in 2015 to a global goal to sustainably manage and protect marine resources. “Oceans’ governance is the classic public good challenge,” said Dominic Waughray, head of the World Economic Forum’s Centre for Global Public Goods. Smart rules are essential to keep oceans healthy – but because nobody owns them, “we have a real problem”, he said. So who are the main players controlling Earth’s final frontier? And how will the global hunt for resources affect the communities who now depend on the seas to survive? From fast-expanding tourist resorts to disputes over maritime borders, fishing communities are finding their main source of income increasingly under threat. In southern Thailand, a tourism boom is pitting the Chao Lay, or people of the sea, against land developers, while marine conservation efforts also limit their traditional fishing grounds. “Our lives have changed. We have to go further and dive deeper to catch fish, and that is affecting our health,” said Ri Fongsaithan, an Urak Lawoi community elder. Some Chao Lay have taken their plight to the courts, fighting eviction from their homes. According to Brad Adams of Human Rights Watch, an advocacy group, the Chao Lay “generally do not assert ownership rights because they believe that land and water should not be owned or controlled by one person, but rather shared by many”. From the waters off the east coast of the United States to the coasts of West Africa, the changes are causing fish and other sea life to seek out new waters – leaving the communities that depend on them facing disruption as a result. Much of the quest for ocean resources, however, lies not near its surface but in its depths. Technological advances and growing demand for minerals used in consumer electronics have fuelled a rush to mine the deep seas. New technology like autonomous robots and deep-diving submarines could allow scientists to unearth treasures like copper, nickel and cobalt. Resource-hungry countries are racing ahead in the hunt for minerals, with India planning to explore a 75,000-square-km area of the Indian Ocean – equal to about 2% of the country’s size. “We are exploring Mars, we are exploring the moon. Why don’t we explore our own oceans?” asked Ramadass, of India’s National Institute of Ocean Technology. China, the world’s second-largest economy, is seeking minerals in the eastern Pacific Ocean. And Brazil has won rights to explore the Rio Grande Rise off its southeastern coast, in the southern Atlantic Ocean. “The more (natural) resources are exhausted on the continent, the more interesting marine mining will become,” said Lauro Julio Calliari, an oceanographer at Brazil’s Federal University of Rio Grande do Sul. But, with little of the deep ocean mapped or explored, environmentalists worry about the potential loss of species not yet well understood – or even recorded. Sediment plumes and disturbance caused by mining could wipe out habitats, including for slow-growing corals and fish, said Richard Mahapatra, managing editor of the New Delhi-based science and environment magazine Down To Earth. In the longer run, disturbing oceans, which absorb carbon dioxide and heat, could affect how they regulate the world’s climate, he added. “We should not rush (deep sea mining). Otherwise we will head towards another disaster,” he said. The hunt for yet another ocean resource – offshore oil – could have disastrous consequences for marine wildlife, campaigners warn. Last December, Italian oil producer Eni began drilling a new well in US waters off the north coast of Alaska – the first company to drill in the area since 2015, and a move warily eyed by indigenous communities. Arnold Brower Jr, executive director of the Alaska Eskimo Whaling Commission, worries that potentially devastating oil spills could affect whale food sources, including krill. “Of course we’re concerned because we’ve seen the mess down in the Gulf of Mexico – BP’s blowout,” he said, referring to the Deepwater Horizon oil drilling rig that exploded in 2010, causing the worst spill in history. Determining who owns or has the right to the ocean’s resources raises another question: Who should police them? The multibillion-dollar seafood industry has come under scrutiny – particularly in Thailand – after investigations showed widespread slavery, human trafficking and violence on fishing boats and in onshore processing facilities. Experts said slavery was also rife on fishing vessels in Cape Town’s luxurious waterfront in South Africa. Part of the problem stems from a lack of oversight on fishermen’s working conditions on the high seas, said Brandt Wagner, head of the transport and maritime unit at the International Labour Organization, a United Nations agency. The main international convention regulating crew safety and conditions on fishing vessels – called the Cape Town Agreement – was adopted in 2012 by the International Maritime Organization, a United Nations agency. But only 10 countries have signed it, according to the Pew Charitable Trusts, a non-profit. “So the international law which is most needed to make sure the fishing vessels are safe is not yet in force,” said Wagner. Dane du Plessis, with South African charity Biblia, has tried to identify and help exploited fishermen when their boats dock in the port of Cape Town. Migrant fishermen told the Thomson Reuters Foundation they were routinely abused by employers, including being punched, forced to drink dirty water and subjected to racist slurs. Experts hope that could change with stricter enforcement of fishing regulation. In May a Taiwanese trawler was detained – and later released – in Cape Town after crew complaints about working conditions. The detention was the first under the International Labour Organization’s Fishing Convention, which seeks to improve fishermen’s working conditions. Du Plessis worries, however, that efforts to identify victims of slavery aboard fishing vessels are “only scratching the surface”. Authorities are trying to police another kind of criminal wreaking havoc on the seas – pirates. While piracy has decreased worldwide in the past decade, the Gulf of Guinea off the coast of West Africa has become an increasing target for pirates who steal cargo and demand ransoms, according to the International Maritime Bureau. Ships in or around Nigerian waters were the target of a series of piracy-related incidents last year, with 10 kidnappings involving 65 crew members, the bureau said in a report in January. Crucial to protecting oceans as pressure mounts is understanding what lies at the bottom, experts say. A United Nations-backed initiative, called Seabed 2030, is trying to do that by pooling data from around the world to produce a publicly available map of the entire ocean seafloor by 2030. “Can you imagine operating on the land without a map, or doing anything without a map?” asked Larry Mayer, director of the US-based Center for Coastal and Ocean Mapping, a research body that develops tools for underwater mapping. “We depend on having that knowledge of what’s around us – and the same is true for the ocean,” he said. The project initiated by the Nippon Foundation, a Japanese philanthropic organisation, and Gebco, a non-profit association of ocean experts, aims to improve knowledge of marine biodiversity, predict disasters and protect deep-sea resources. From underwater drones to crowdsourced data from fishing boats, new technology could drastically speed up the mapping process, researchers said. “With advanced sonar technology it really is like seeing. I think we’ve come out of the era of being the blind man with the stick,” said Robert Larter, a marine geophysicist at the British Antarctic Survey. Advances in technology could also help in the fight against illegal, unreported and unregulated fishing, with theft estimated to be worth $23.5 billion a year, experts said. A range of platforms are tracking fishing on the high seas and in marine reserves, aided by radio and satellite data that transmits vessel locations and movements, allowing authorities to identify illegal behaviour. But political infighting is a roadblock in the way of data and knowledge-sharing, said Julian Barbiere of Unesco’s Intergovernmental Oceanographic Commission, which is supporting the Seabed 2030 initiative. Some countries are reluctant to share what they consider strategic data with the project, he said, largely due to national security concerns or because it comes from areas with sensitive geopolitical tensions, such as the disputed South China Sea. But too much is at stake for countries to hoard data, he said. “It goes back to this principle: the ocean is an international space by definition ... part of the common heritage of mankind,” said Barbiere.